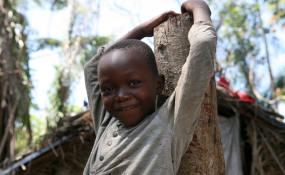 A child in Linakofo IDP camp, northeastern DRC (file photo). The social and economic costs of undernutrition are revealed in a new study released in Kinshasa today. The Cost of Hunger in Africa (COHA) study was undertaken by the government of DRC in collaboration with the United Nations World Food Programme (WFP), the African Union Commission (AUC), the New Partnership for Africa's Development (NEPAD), and the UN Economic Commission for Latin America and the Caribbean (ECLAC). "I welcome this important joint initiative which will contribute significantly to the government's efforts to minimize the loss of human and economic potential to malnutrition," said DRC Prime Minister and Head of Government Bruno Tshibala Nzenzhe, at the launch ceremony in Kinshasa. "Malnutrition is a silent emergency, accounting for nearly half of all infant deaths. For the country to develop, we need to address this situation urgently." According to the report, DRC could save up to CDF355 billion (around US$383. million) by 2025 if the prevalence of underweight children is reduced from 11 to 5 percent and if stunting (low growth for age) is reduced from 43 to 10 percent. "These results call on all of us to act now to avoid future losses caused by hunger," said WFP Country Director in DRC, Claude Jibidar. "I'm convinced that with the understanding we now have of the terrible economic and social impact of malnutrition on children, we and our partners can work with the government to make a real difference to this alarming situation." "In line with Agenda 2063 - 'The Africa we want' - we seek to completely eliminate hunger and food insecurity on this continent during coming decades," said Kefilwe Moalosi, speaking on behalf of the African Union Commission and NEPAD. "Africa has the potential to reap a demographic dividend from a young, educated and skilled workforce. But this potential can only be harnessed if we continue to invest in the health and nutrition of its people, particularly its women and children, and secure the necessary economic growth".